Surprise reveal at Andover High track practice for Hannah Showalter. At El Dorado High to surprise Taylor Brock. Surprise reveal at Salina South with Jade Burroughs. Jesse Nightingale learns that she's a winner of the Rudd Scholarship at ice skating practice. Recognizing Jadie Chauncey at the Junction City High Senior Awards Assembly. Recognizing Sara Amend at the Goodland High Awards Assembly. Surprising Abbigayle Tyler at Hutchinson High. Clearwater High's own Tatyana Miner. Recognizing Michaela Forkenbrock at the Lyndon High Awards Assembly. Rudd Scholarship winner Shaley Leedy from Field Kindley Memorial High in Coffeyville is welcomed at the recognition dinner. She will be attending Wichita State University. The 2018 Rudd Scholar recognition dinner in Wichita. Corri Roberts meets with scholars and their families at the reception prior to the Rudd Scholarship dinner. 2018 Rudd Scholars attending Emporia State University. Each Rudd Scholar received a certificate, a letter from our Founder, the "Go-Getter," and a T-Shirt! Rudd Scholar Taryn Lee connects with other scholars during the reception prior to the Scholarship Recognition Banquet. She will be attending Emporia State University. 2018 Rudd Scholars attending Wichita State University. Scholarship winners enjoying the celebration banquet. Pete Najera makes opening remarks at the 2018 Rudd Scholar Recognition Dinner. 2018 Rudd Scholarship Winners attending Emporia State, Fort Hays State, and Wichita State University. Corri Roberts presents Cydney Bergmann with her Rudd Scholar Certificate. She will be attending Fort Hays State University. Aaron Clark receives his Rudd Scholarship from Corri Roberts and Pete Najera. He will be attending Emporia State University. 2018 Rudd Scholar Meleny Jacome-Banuelos from Stanton County High waits in line with her family to take her "official" Rudd Scholar photo. Cara Babcock of Lansing High will be taking her full scholarship to Emporia State University. Vincent Tran from Wichita South High enjoys the reception before dinner with his family. He will be attending Wichita State University. Rudd Scholar Michaela Forkenbrock discusses her future at Emporia State with invited Admissions and Financial Aid staff from ESU. Michael Rivera from Shawnee Mission North will be using is Rudd Scholarship at Wichita State to pay for all remaining tuition and fees, book and supplies, and room and board. Pete Najera meets Riston Landwehr and his family from Medicine Lodge at the reception prior to dinner. Congratulations to Danica Kostner from Kingman who will be attending Fort Hays State University with her Rudd Scholarship. The 2018 Rudd Scholarship Winners! Rudd Scholars compete in the “Clash of the Colleges” at Wichita State to open the year. Back to School Dinner at Emporia State University. Rudd Scholars can move-in early on campus and do organized pre-orientation to get ahead. Rudd Scholars at Wichita State come together for orientation and pizza! 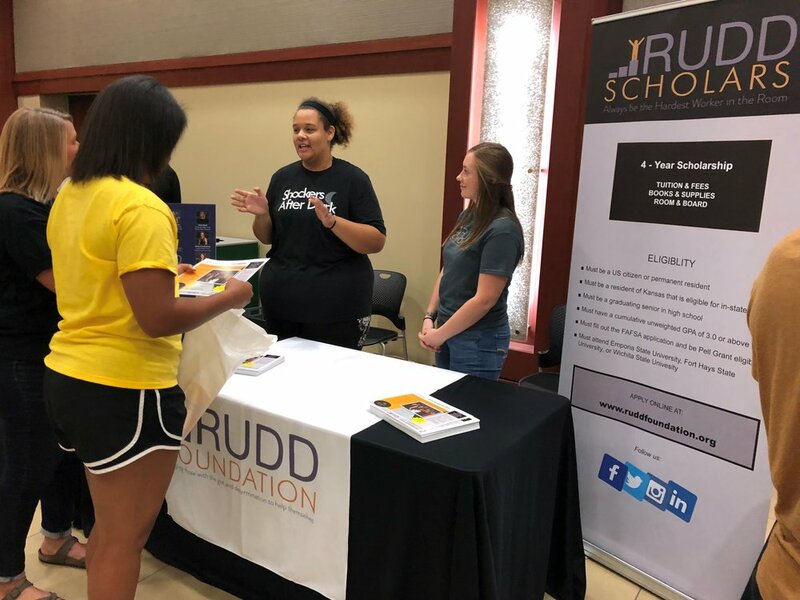 Rudd Scholars meet with staff and advisors at Fort Hays State University. Every Rudd Scholar participates in monthly 1-on-1 Success Coaching and Mentoring. Rudd Scholars at Emporia State huddle up after another great day! Rudd Scholars help recruit the next class. "To whom much is given, much is expected."